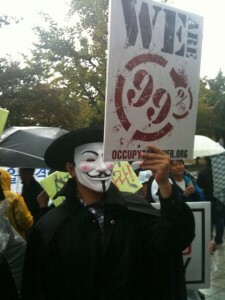 The Occupy Wall Street movement has landed in the South Korean capital, Seoul. Despite heavy rain, lightening and thunder, and a sudden drop in temperature, about 300 people came together for the Occupy Seoul protest on October 15, 2011. They first gathered at outside the Financial Supervisory Service on Yeoido, Seoul's financial core and later marched on to other places in downtown Seoul. The twittersphere lit up with tweets and photos sent by young people and activists protesting financial inequality. Some photos were also posted [ko] on Wiki Tree, South Korea's online citizen news site. 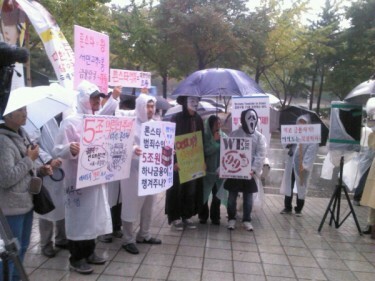 Min Gyeong-chul (@mgc0909) tweeted several photos of the protest. In the picture below, his caption [ko] reads, “We are in front of headquarters of the Financial Supervisory Service. There is heavy downpour and lightening, but we, the 99% resist the financial exploitation of the 1%. 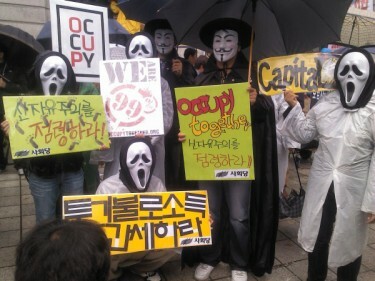 ‘Occupy Yeouido in Seoul!'”. 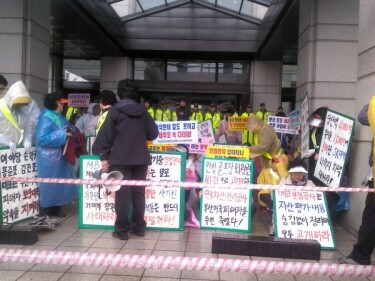 The photo below is from a sit-in protest by victims of Busan Savings Bank's failures. There were strong allegations that this scandal-ridden savings bank has used slush funds to lobby government officials and lawmakers to cover up their irregularities. As I expected…They tried to block the Occupy Wall Street protest, calling it illegal. Why can't we do it when all the rest of the world does? 월가시위는 순수한데 오늘 서울점령은 불순하다는 보수언론의 망발! 월가시위는 부자증세,공정사회화 등을 요구하는 “정치적” 시위다. 그리고 옳다. 서울시위도 옳을 것. When will those conservative media ever stop ranting! They call the Wall Street protest a pure (grassroots) movement, while blaming Occupy Seoul of being ‘ridden with some (devious) intentions’. You see, the Wall Street protest is a ‘political’ protest demanding taxing riches and restoring fairness in society. And they are right. So is Occupy Seoul. 월가 시위하는 것들! 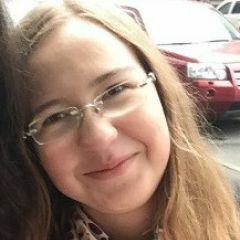 평소에 반미 반미 외치면서 미국이 뭐만 하면 무조건 따라하다가 이젠 시위까지 따라하냐? 그러니 너네가 어디가서 대접도 못받는거야. 좀비들아! You thugs doing the Wall Street protest! You are the one who used to say ‘anti-U.S, anti-U.S!’ all the time. But you always copy the U.S. and now you copy their protest? That is why you are being treated unfairly in many places, you Zombies! In South Korea, even people who openly endorse the Wall Street protest, really don't grasp the protest's agenda. Some people understand it as a resistance of leftists against the capitalism. But it is beyond that. 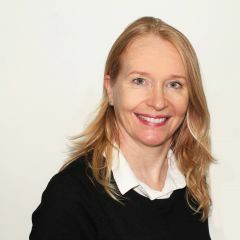 It is a monumental battle between the grassroots and the privileged class. It is a matter of life and death for those ordinary people. Activists groups say that there is another Occupy Seoul protest planned for October 21, 2011. We live in a country no longer represented by the people but by the interests of major corporations and the money they use through lobbying to pay off our elected officials. These politicians no longer voice the opinion of the voters who put them in office but instead speak for the special interests which pay them more and more money to turn a blind eye to the destruction of our environment and the extinction of the middle class. How long will the occupations have to last before a SINGLE government official asks what WE the PEOPLE want changed? Visit my artist’s blog at http://dregstudiosart.blogspot.com/2011/09/occupywallstreet.html to see my art for the movement and also see videos of the protests and police brutality as well as get other sources for coverage of the movement. Wow the protesting is spreading everywhere now. Look what you started banks! If you don’t know why the protesters are protesting, this article gives a very good explanation.